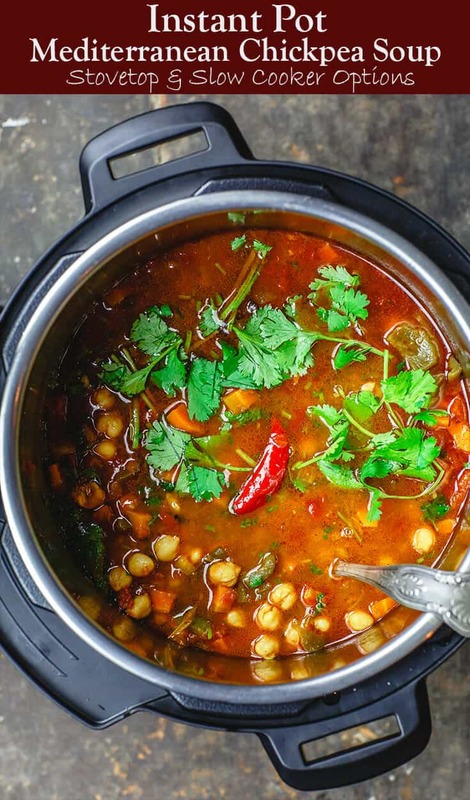 Easy Instant Pot soup with chickpeas, chopped veggies, fresh herbs, and just the right combination of Mediterranean spices. Loads of plant-based protein. Low-Carb. Vegan. And Gluten Free. 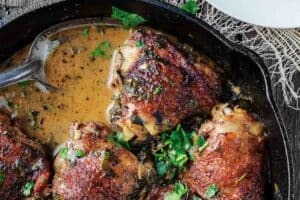 Stovetop and Slow Cooker recipe instructions included. Not long ago Grub Street shared this news that 82 percent of meals in America are now made at home and people not eating out as much. A cynic might say, “because we’re broke!” But isn’t it true that cooking at home allows us to share healthier, wholesome meals with our loved ones? And home cooks are now more savvy than ever, we’ve got all sorts of one-pot meals, and we can even cut cooking time by a using an Instant Pot or pressure cooker. Now, this chickpea soup is literally my first instant pot soup; I’m a newbie (just bought this Instant Pot Ultra 10-in-1). But, I’m excited to try more instant pot recipes, particularly on busy week nights. Layers and layers of goodness in this instant pot soup recipe. Chickpeas combined with chopped veggies, garlic, and fresh herbs. All-natural spices like coriander, cumin, Aleppo pepper, and turmeric, give us complex, warm Eastern Mediterranean flavor. A splash of lemon juice brightens things up. 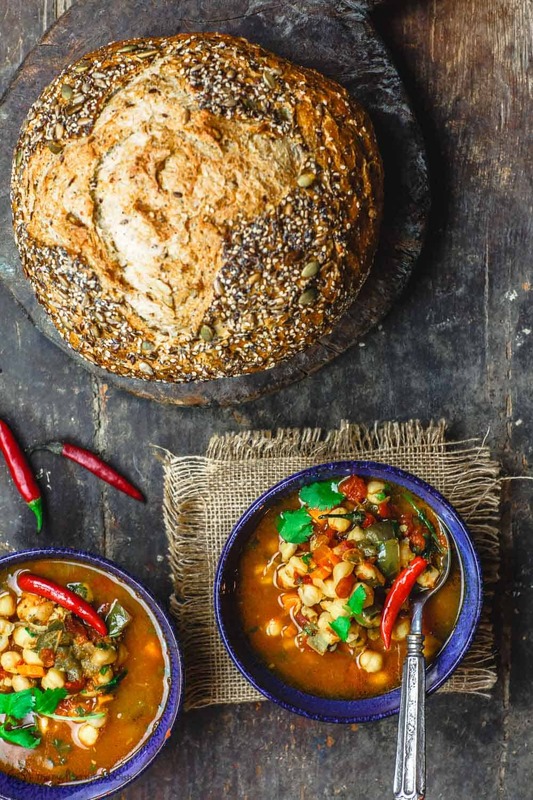 Nutrition-wise, you really can’t go wrong with this low-carb, vegan, gluten free chickpea soup. Chickpeas, as with any bean variety, provide a ton of plant-based nutrition and protein. One serving of this instant pot soup provides 40% of your daily protein intake; 161% of needed vitamin C; and 25% iron! 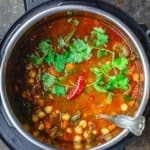 Can I make this chickpea soup on stovetop or slow-cooker? Yes! If you don’t have an Instant Pot or pressure cooker at this point, you can still make this tasty chickpea soup stovetop or in your slow-cooker. Of course, you will need to budget more cooking time. I’ve included instructions for both in the recipe notes below. 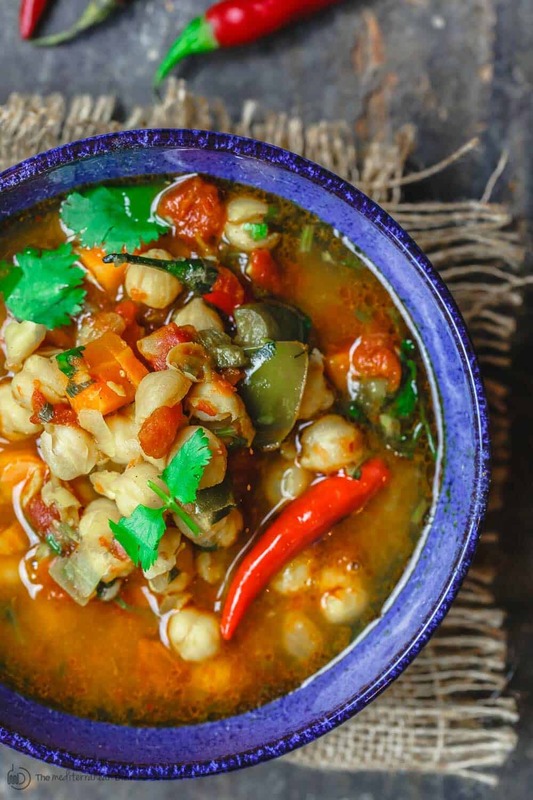 Oh, and you can prepare this chickpea soup ahead. It’s even better the next day, once all the flavors had a chance to meld. See notes for make-ahead instructions and storage. 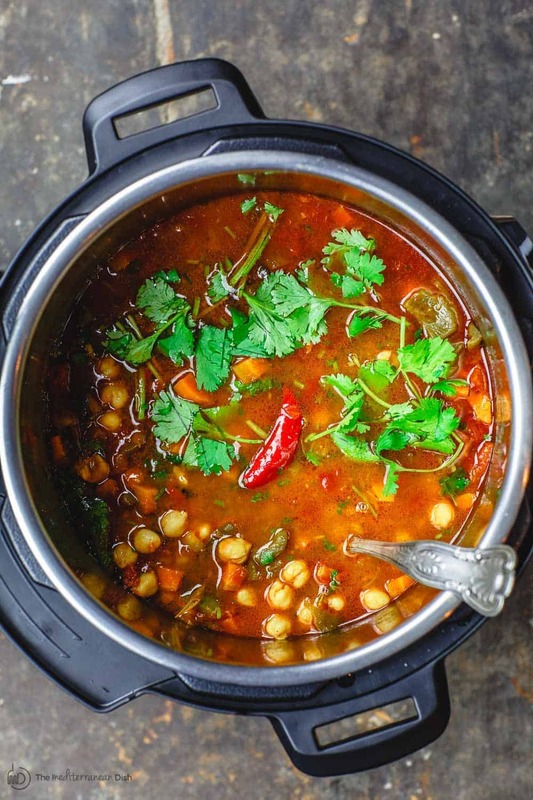 Mediterranean instant pot soup recipe with chickpeas, vegetables, fresh herbs & warm spices. Vegan. GF. Low Carb. See recipe notes for stovetop and slow cooker instructions! Place chickpeas in a large bowl and add plenty of water (about 1 quart) to fill the bowl. Leave overnight to soak. Drain well. Preheat your Instant Pot by selecting the saute function and adjust heat to high. Add 2 tbsp extra virgin olive oil and heat until shimmering. Add onions, garlic and a pinch of salt. Cook 3 mins, stirring regularly. Add carrots, bell peppers, and spices. Cook another 4 minutes or so, stirring, until vegetables have softened a bit. After cooking, allow time to let pressure release naturally. OR after 10 minutes or so, you can use the quick release function to let any remaining pressure out. Unlock and remove the lid. Stir in lemon juice and fresh cilantro. Carefully taste and adjust seasoning as desired. Transfer to serving bowls and drizzle extra virgin olive oil. 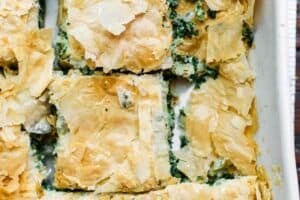 Serve with your favorite crusty bread or this Lebanese rice. Important: please consult your Instant Pot or pressure cooker manual for complete safety instructions. Because there are a variety of Instant Pot or pressure cooker models out there, you will want to review the different settings and select what best works according to the manual. Stovetop Instructions: Use a large Dutch Oven and heeat 2 tbsp extra virgin olive oil over medium-high heat. Follow step #2 above. Add chickpeas, tomatoes, and broth. Bring to a rolling boil for 5 minutes, then turn heat down. Cover and let simmer for 1 1/2 hour or until the chickpeas are tender and fully cooked through. Remove from heat. Follow steps #5 and #6. Slow Cooker Instructions: You will start on stovetop. Place a large skillet over medium-high heat. Add 2 tbsp extra virgin olive oil and follow step #2 as written above. Transfer the veggies to the bottom of a large slow cooker. Add the remaining ingredients (except the lemon juice and cilantro). Set slow cooker setting on high for 4 to 5 hours or on low for 8 hours. When ready, stir in lemon juice and fresh cilantro, following steps #5 and #6 as written above. Make-Ahead Note: This soup is even better the next day as the flavors meld. Let cool, then transfer to a glass container with a tight lid. Store in the fridge for later use. It should keep 3 to 4 days. Recommended for this Recipe: Private Reserve or Early Harvest Greek extra virgin olive oil. SAVE! 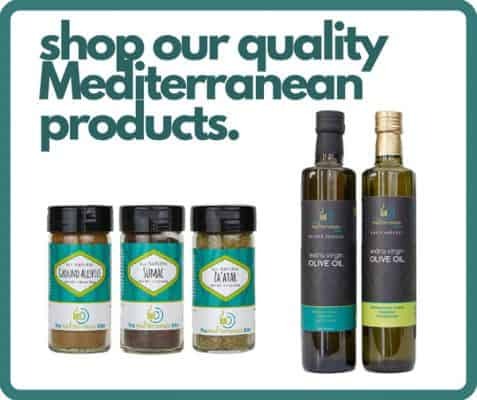 Try our EVOO Bundle! Will the recipe work of I don’t soak the chickpeas overnight ? Or at all? Chickpeas do have to be soaked overnight. You can use canned chickpeas instead for the stovetop option. Can’t wait to try your chickpea instant pot soup. PLEASE KEEP THE INSTANT POT RECIPES COMING. Hey for that matter, do you have any Mediterranean Air Fryer recipes. Thanks for all the great recipes. What kind of peppers did you use? They look like ripe Serrano peppers, but I want to be sure to get the correct flavor profile as I know they all have their own delicious flavor unique to the variety. 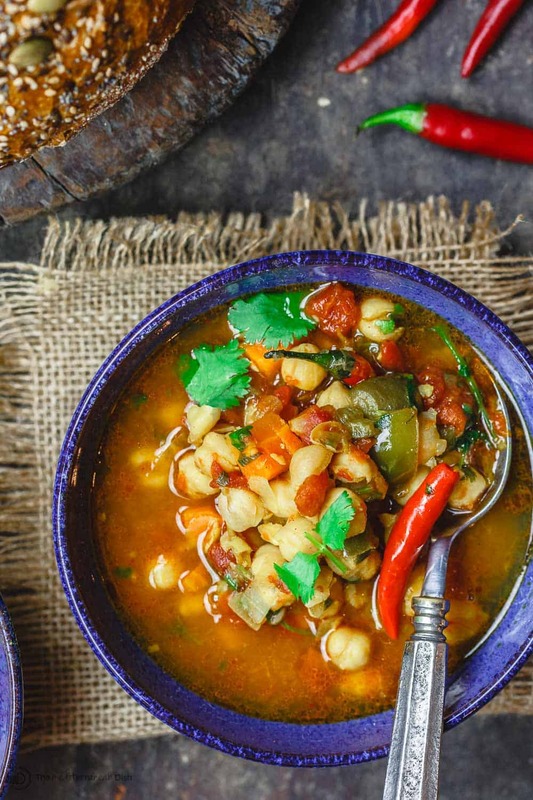 2 things I’m loving about this recipe: chickpeas and spices to kick up the flavor of an otherwise plain vegetable soup and the ease of making this either stove top or slow cooker! 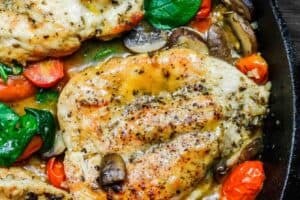 Another win for the instant pot! Can’t wait to make this delicious soup!! So many herbs! Super delicious!! Could you use canned chickpeas? Hey, Beth. You probably could but watch the cooking time. I’d do it stovetop at that point, probably. It wont’ take very long. I’ll take this for dinner tonight! Yay! Can’t wait for you to try it! 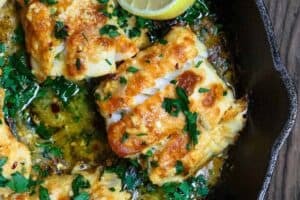 This looks so good and planning to make it for dinner already! Wondering if substituting canned chickpeas will have the same flavor and if so what changes do you recommend to the process? Thanks!! Quality canned chickpeas can work here. You probably could do it stovetop, it won’t take that long at that point, but long enough for flavor to develop. This looks incredible, I love comfort food that’s also healthy! Total comfort food for the win! This is perfect for a chilly fall night dinner! So cozy and looks delicious! Homemade meals really are the best, and it’s great that we have so many wonderful tools to assist us! Thank you for sharing this delicious recipe. Adding this to the fall dinner line-up! Perfect for when we want a comforting and cozy dinner! Oh my gosh, this looks amazing and your photos really stand out for the recipe. I just bought an Express Pot and am dying to use it. I’m waiting for my days off to play around with it. 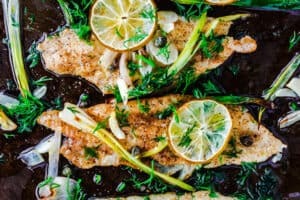 Can’t wait to try some new recipes and this looks too good to not make. Is it wrong that I want to do a swan dive into that bowl of soup?